Spray It, is a family owned business located in Clinton, New Jersey. We strive to provide excellent customer service. Grant Miller, owner, personally supervises all jobs and is available to discuss any questions you may have about any aspect of Spray Foam Insulation. Our goal is to provide you with a knowledgeable staff, prompt service and a clean job site. Seals Cracks and Crevices Protects you from air infiltration, drafts and moisture, creating a more comfortable home environment. Controls Dust and Allergans By sealing leaks around windows and doors where air travels you reduce or stop the entry of dust and allergans. 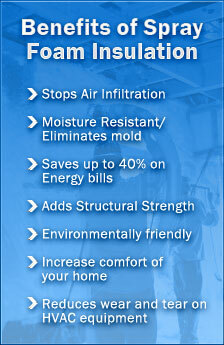 Spray foam is perfect for pole barns and garages.